After two and a half days locked in their cabins - luxurious cabins, but even a golden cage was still a cage - it was relieving to finally get fresh air again. It had been an unpleasant surprise when the captain had announced they weren't even allowed to watch the takeoff. Furthermore, not leave the preinstructed corridors or make any drawings of the ship, interview the crew, or a number of other, seemingly absurd instructions, that had made Orjugran call them a delusional band of oversuspicious scoundrels, just less polite. Captain Korslamin had laughed about the garren outbreak of disapproval, but only shortly; explained that she expected everyone to follow the rules, and that she would personally put a spell on any deviant. Now, the maneuvers that might have told the passengers how the legendary dustship flew seemed complete, and the crew was friendly; so was the weather, which was unexpectedly sunny for a spring day in the Pillar Street. Orjugran, who was happily lolling about in the sun, Vasmir, with an excited Mokri on his shoulder, and Benové met on the middle deck, where other passengers were stretching their legs as well. Vasmir blinked into an almost cloudless sky; the days before and during departure it had rained in varying strength. "It gets drier towards Lozir", Benové yawned, "in case you're wondering why the rain stopped." The mapper was knowledgeable about climates and could tell them much about their travel destinations besides that. She stretched and, a little more awake, leaned on the railing betweeen Vasmir and Orjugran. Mokri had went to play with some other solano and a ball. Below them stretched the sea, dotted with single rock spires. Many spots were so shallow the ground could be seen - reefs, shipwrecks as well, countless fish. Vasmir regretted to have missed the seafolk settlements off the coast. But the trip with the dustship was worth some sacrifices. The movement was completely smooth, and the Gral-én'tach was so big it seemed like a village. The crew had leisure while things were calm, and played with each other, the solano, or the many flying animals living aboard. On the afterdeck, the message master was teaching some of the half-meter-tall hallromm butterflies and his apprentice, a handful of yaafs chased each other around the masts. Vasmir followed the hallromms with his eyes to the first of the three floatrocks above the ship. He spotted a stately bush on it, covered in pink blossoms, which was buzzing with the coming and leaving butterflies. Benové sighed blood-curlingly and conversation-demanding. Vasmir noticed she had for the first time taken off her many bags. She looked slim and, most of all, bored. "No maps? Papers, compasses, measuring tools? ", Vasmir bantered. Benové looked to the sailors. Four out of five wore wizard's belts, and she had seen over twenty collectors. After Korslamin's urgent instructions, she didn't want to imagine the reaction if she turned up with drawing tools. She groaned inside. Maps of the Pillar Street were really lucrative, and the air view was fantastic. "I suspect I couldn't take it as well as you when they threw me overboard, just because my solan dug a hole through two decks", she said loftily. Vasmir looked, made uncertain, for Mokri, who was peacefully playing with her companions. No signs that the pound-o'-rodent would bring doom upon the world's largest dustship. Orjugran giggled. 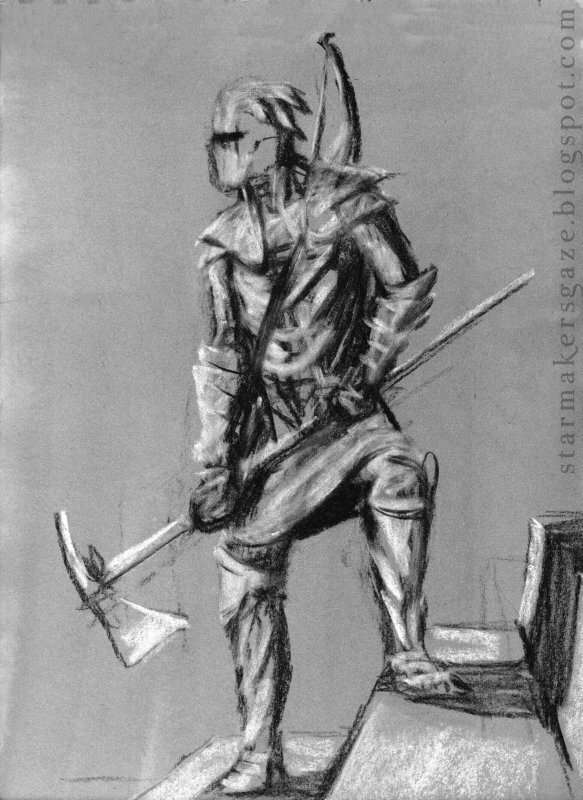 "Well", Vasmir answered with dignity, "if one will create destruction worthy of mention in history, one should at least survive it to tell the bards the story correctly." Benové inclined her head to show she yielded, Orjugran applauded lightly. "The Gral-én'tach will not fall from the skies from a simple digging fit of a solan." The sailor nimbly set down on the railing and took the half step down to the deck. The railing didn't reach the hip of the many raganaj sailors. Her solan, an wiry creature, spryly scurried over her middle wing to the ropes and hurried to the playground. "They tell each other how things are done aboard. Don't worry", she turned to Vasmir, grinning. The sailor's name was Map'heela, she was amiable and very proud of the ship. It was her pleasure to indulge them with stories about passengers and journeys, the weather was pleasant, the sea colourful in the shallow waters and mysterious in the deep. When Benové had Map'heela about to take her to the navigator to gain permission to map, the sea arched below them. Moments later a smooth island rose, quickly gliding forwards, followed by an enormous tailfin that slapped the water thunderously. Map'heela said it quietly into their astonishment. The tailfin had been just the first, many more backs and fins followed; some horr rose up further from the water and fell back heavily. The swarm was seemingly endless. It was said it was so big, it all but spanned the world. Orjugran was at first stiff with astonishment, then broke into ardent restlessness, ran to and fro and gestured wildly, while she buried Map'heela in questions. "Do they pass Gdera in the north or south? Do they rest in the Ryaq? How many are there? How old do they become? Is it true they eat ships?" "That you can check yourself", Map'heela laughed, then jumped over the railing to follow other sailors into the rigging. The shadow of the floatrocks quickly crossed the deck while the ship was lowered, until they were only a few dozen meters from the surface, and could see the young horr under their parents. Some fountains they blew up almost reached the ship, and it seemed to Vasmir like the horr also came up higher out of the water now. The Gral-én'tach was enormous, but the horr dwarfed it. Orjugran hung far over the railing, tail twitching excitedly. "Can we go too? ", she inquired breathlessly and punched Vasmir with the elbow. She pointed towards one of the smaller rocks, which had so far been floating below the ship. Now they were low over the water, and two carried raganaj and other passengers. Vasmir liked flying with Orjugran, but it was part of the game to play hard to get. "I dunno; with all those fountains and your twitchy tail, we might drop into this grinding apparatus of fish." "Oh, I'll warn you, and I'll hold perfectly still", Orjugran assured him eagerly. Devotedly, and suppressing a grin, he held open his arms. Orjugran stepped on his foot, stressing to hold her trembling tail still, and held on to Vasmir's arm. Vasmir swung over the railing and let them fall. At least his worries about the fountains were real, but Orjugran kept her word and warned him about every single one. The floatrock was just large enough they could stand on it comfortably, but Vasmir had to use his wings to keep them from falling, while Orjugran was pointing in every direction. The procession of horr endlessly swam past them. After three hours, they had crossed its width and rose up again, and Vasmir and Orjugran returned aboard. Benové and a crewmember sat in comfortable, slightly oversized low seats; she just laid finishing strokes on a map. "Navigator Pakrahna bought my powerline maps", she said contently, stamped the paper and handed it over with both hands. "We appreciate quality", said the navigator and returned Benové's politeness. Orjugran loosed her flood of impressions on Benové, enriched with gestures and sound effects. Finally, she sat down exhaustedly. A moment she was still, then started rummaging around in her pockets. Finally, she pulled a paper out that had been folded many times, on which she put two marks with Benové's pen. Mokri, who sat on Orjugran's chair's back, squeaked inquiringly. "Go on a dustship - check. See the horr - check", Orjugran said more than satisfied and put away the paper. "Now, a hiller in Lozir, and I'll call this journey a success." I hope my use of prepositions isn't awful. I'll be happy for corrections. This is one of my first attempts to provide prose for Genius Loci and was written in German first. From names to my personal expressions this was hard to translate; I think it went okay, but I'd love to hear opinions. This was the original German text to the translated English version above that I provide here for your interest. While I ususally get along fine in English, I am a native in a different tongue. Nach zweieinhalb Tagen eingesperrt in ihren Kabinen - verschwenderisch ausgestatteten Kabinen, aber auch ein goldener Käfig war ein Gefängnis - war es wohltuend endlich an die Luft zu kommen. Es war eine unerfreuliche Eröffnung gewesen als die Kapitänin angekündigt hatte, sie dürften nicht einmal dem Abheben zusehen. Außerdem nicht die vorgeschriebenen Korridore verlassen oder irgendwelche Zeichnungen des Schiffs anfertigen, die Mannschaft ausfragen und noch eine Anzahl anderer teils absurd scheinender Anweisungen, die Ordschugran dazu veranlasst hatten die Mannschaft als wahngeplagte Bande von vermutlichen Halsabschneidern zu bezeichnen, nur weniger höflich. Kapitänin Korslamin hatte über den garrischen Unmutsausbruch gelacht, aber nur kurz, erklärt, dass sie Folgsamkeit erwartete, und jeden beflüstern würde der die Anweisungen missachtete. Jetzt waren anscheinend alle Manöver abgeschlossen, die den Mitreisenden hätten verraten können wie das legendäre Staubschiff flog, und die Mannschaft war freundlich; ebenso wie das Wetter, das unerwartet sonnig für den Frühling in der Säulenstraße schien. Ordschugran, die sich wohlig in der Sonne räkelte, Wasmir mit einer aufgeregten Mokri auf der Schulter und Benowe trafen sich auf dem Mitteldeck, auf dem auch andere Passagiere herum spazierten. Wasmir blinzelte in den fast wolkenlosen Himmel; die Tage vor und während des Abflugs hatte es wechselnd stark geregnet. "Es wird trockener Richtung Lozir", gähnte Benowe, "falls ihr euch wundert warum es nicht mehr regnet." Die Kartnerin kannte sich mit den meisten Klimalagen aus und hatte auch sonst viel zusätzliches Wissen über ihre Reiseziele zu bieten. Sie streckte sich und stützte sich etwas wacher zwischen Ordschugran und Wasmir auf die Reling. Mokri tummelte sich mit einer Handvoll Solano mit einem Ball. Unter ihnen erstreckte sich das mit einzelnen Felsnadeln gepunktete Meer. An vielen Stellen war es so flach dass man den Boden sehen konnte - Riffe, auch Wracks von Seeschiffen, unzählige Fische. Wasmir bedauerte dass er die Seevolksiedlungen vor der Küste verpasst hatte. Die Fahrt auf dem Staubschiff aber war einige Entbehrungen wert. Die Bewegung war absolut glatt, und die Gral-én'tach war so groß dass sie den Eindruck eines kleinen Dorfs machte. Die Mannschaft hatte Freizeit während die Fahrt so ruhig war, und spielte miteinander, den Solano oder den vielen Flugtieren die auf dem Schiff zuhause waren. Auf dem Hinterdeck bildete der Botenmeister einige der halbmetergroßen Hallrömmfalter und seinen Lehrling aus, eine Handvoll Jaafe jagte sich um die Masten. Wasmir folgte den Hallrömms mit den Augen bis zum vorderen der drei Flugfelsen die über dem Schiff hingen. Er entdeckte einen stattlichen Busch darauf, mit rosa Blüten bedeckt, um den ein emsiges Kommen und Gehen der Schmetterlinge herrschte. Benowe seufzte markerschütternd und gesprächsheischend. Wasmir fiel auf dass sie das erste Mal ihre vielen Taschen abgelegt hatte. Sie wirkte schmal und vor allem gelangweilt. "Kein Kartenwerk? Papiere, Zirkel, Messgerät? ", fragte Wasmir neckend. Benowe sah zu den Seglern. Mehr als vier Fünftel von ihnen trugen Zauberergürtel, und sie hatte über zwanzig Sammler gesehen. Nach Korslamins eindringlichen Anordnungen mochte sie sich nicht vorstellen wie die Reaktion ausfiele wenn sie mit Zeichenwerkzeug aufkreuzte. Sie stöhnte innerlich. Karten der Säulenstraße brachten wirklich viel Geld ein, und die Luftperspektive war fantastisch. "Ich glaube nicht dass ich so gut wie du überstünde wenn sie mich über Bord würfen, nur weil mein Solan ein Loch durch zwei Decks buddelte", erwiderte sie leichthin. Unsicher blickte Wasmir zu Mokri, die friedlich mit ihren Gefährten spielte. Keine Anzeichen dass der pfundschwere Nager den Untergang des größten Staubschiffs der Welt herbeiführen würde. Ordschugran kicherte. "Nun", erwiderte Wasmir würdevoll, "wenn man schon geschichtsträchtige Zerstörung anrichtet sollte man sie wenigstens überleben können um danach die Dichter zu belehren." Benowe neigte den Kopf um ihre Aufgabe zu bedeuten, Ordschugran applaudierte verhalten. "Die Gral-èn'tach stürzt nicht von einem einfachen Grabanfall eines Solan ab." Eine Matrosin setzte leichtfüßig auf der Reling auf und ging mit einem halben Schritt aufs Deck hinunter. Die Reling reichte den zahlreichen Raganaj an Bord nicht bis zur Hüfte. Ihr Solan, ein drahtiges Geschöpf, wieselte flink über ihren mittleren Flügel in die Seile und beeilte sich zum Spielplatz zu kommen. "Sie erzählen einander wie's an Bord läuft. Keine Sorge", wandte sie sich grinsend an Wasmir. Die Matrosin hieß Map'hila und war freundlich und deutlich stolz auf das Schiff. Bereitwillig erzählte sie von Fahrten und Passagieren, das Wetter war angenehm, das Meer farbenprächtig im flachen Wasser und geheimnisvoll im tiefen. Als Benowe Map'hila schon fast soweit hatte sie zum Navigator zu bringen um eine Genehmigung zum Kartieren zu bekommen, wölbte sich unter ihnen das Meer nach oben. Augenblicke später erhob sich eine glatte Insel die schnell vorwärts glitt, dann folgte eine gewaltige runde Schwanzflosse, die mit einem Donnerknall aufs Wasser schlug. Map'hila sagte es ruhig in ihr Staunen hinein. Die Schwanzflosse war nur die erste gewesen, es folgten viele weitere Rücken und Flossen; einige Horr stiegen weiter aus dem Wasser empor und ließen sich schwer fallen. Der Schwarm schien kein Ende zu nehmen. Es hieß er sei so groß dass er fast die Welt umspannte. Ordschugran war erst in Staunen erstarrt, dann in begeisterte Unruhe verfallen, wuselte hin und her und gestikulierte wild, während sie Map'hila mit Fragen überschüttete. "Schwimmen sie nördlich oder südlich um Gdera herum? Rasten sie im Ryaq? Wie viele sind es? Wie alt werden sie? Ist es wahr dass sie Schiffe essen?" "Das kannst du selbst überprüfen", lachte Map'hila während sie über die Reling sprang und anderen Matrosen ins Segelwerk folgte. Die Schatten der Felsen liefen übers Deck während sie an Höhe verloren, bis sie nur noch wenige Dutzend Meter über dem Wasser hingen und die Jungtiere unter den Eltern ausmachen konnten. Einige der Fontänen reichten fast ans Schiff heran, und es schien Wasmir als ob die Horr jetzt auch höher aus dem Wasser kamen. Die Gral-én'tach war riesig, aber die Horr waren um einiges größer. Ordschugran hing mit erregt peitschendem Schwanz weit über die Reling. "Können wir auch? ", fragte sie atemlos und boxte Wasmir mit dem Ellbogen. Sie zeigte auf einen der kleinen Felsen die bisher weit unter dem Schiff gehangen hatten. Jetzt waren sie nur noch knapp über dem Wasser, und zwei trugen Raganaj und Passagiere. Wasmir flog gern mit Ordschugran, aber es gehörte dazu dass er sich zierte. "Ich weiß nicht; mit den Fontänen und deinem Schwanz stürzen wir womöglich in dieses Mahlwerk aus Fisch." "Oh, ich warne dich, und ich halte ganz still", versicherte Ordschugran eifrig. Ergeben und unterdrückt grinsend hielt Wasmir die Arme auf. Ordschugran stellte sich auf seinen Fuß und hielt mühsam den zitternden Schwanz still während sie sich an Wasmirs Arm klammerte. Wasmir schwang sich sitzend über die Reling und ließ sich fallen. Zumindest seine Sorge über die Fontänen war echt, aber Ordschugran hielt Wort und berichtete von jeder einzelnen. Der Fels war gerade groß genug um bequem darauf zu stehen, aber Wasmir musste die Flügel einsetzen damit die in alle Richtungen zeigende Ordschugran nicht fiel. Der Zug der Horr schwamm unendlich an ihnen vorbei. Nach drei Stunden hatten sie seine Breite überquert und stiegen wieder höher, sodass Wasmir und Ordschugran an Bord zurückkehrten. Benowe und ein Schiffer saßen in bequemen, etwas übergroßen Sitzpfuhlen; sie legte letzte Hand an die Legende einer Karte. "Navigator Pakrana kaufte meine Kraftlinienkarten", erklärte sie zufrieden, stempelte das Papier und überreichte es beidhändig. "Wir wissen Qualität zu schätzen", sagte der Navigator und erwiderte Benowes Höflichkeit. Ordschugran ließ ihre Flut von Eindrücken auf Benowe los, unterstrichen mit Gesten und Lautmalereien. Schließlich ließ sie sich erschöpft in einen Pfuhl fallen. Einen Moment hielt sie still, dann begann sie in ihren Taschen zu kramen. Schließlich zog sie einen oft gefalteten Zettel hervor, auf dem sie mit Benowes Stift zwei Markierungen setzte. Mokri piepste fragend. "Staubschiff fliegen - jepp. Horr sehen - jepp", sagte Ordschugran überaus zufrieden und räumte den Zettel wieder weg. "Jetzt noch einen Berger in Lozir und ich nenne diese Reise einen Erfolg." "A few years ago, some wise guy thought if he murdered an Eastwesterner, there would be an open spot for him. It speaks for their skill that the fool survived his stunt. I think they made him a listener as punishment, but that won't improve his chances either." The Eastwesterners are the famed defenders of the great city Gamahan. They defend the city first and foremost, while they also have less known objectives. 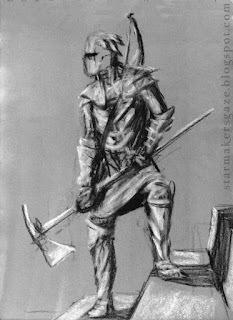 Their honour is legendary, as is their strength; their main weapons are the five-man-bow and the hammeraxe, even the raganaj among them wear full armour and can still fly, in short, the Eastwesterners are a sight to behold. The Eastwesterners are a small order, with little more than two hundred members at any time. The city council may call upon them, but rarely does, and so the Eastwesterners frequently lend their strong arm to the voices and their unfathomable goals. "As students we used to imagine legendary warrior team-ups, and we all agreed: The most impressive would be a bunch of Eastwesterners and a handful of Brightholdians. We excitedly shuddered at the thought; I do hope that a need for something like that never arises." The legendary feat of the Eastwesterners was the protection of Gamahan during the Splinter War. When the shapeshifter armies invaded, the Eastwesterners were the spearpoint of the counterattack, and their devastating blows, fierce tactics, and unwavering line freed Gamahan within only days; a service the Gamahanians have not forgotten. Ever since I learned of the existence of oversized bows - to be drawn lying down and using both hands and feet, with arrows the size of spears - I wanted to have a fantasy element where that is the actual main weapon, and here we are. The burrmo are large predators of the Great Forest in Gdera. 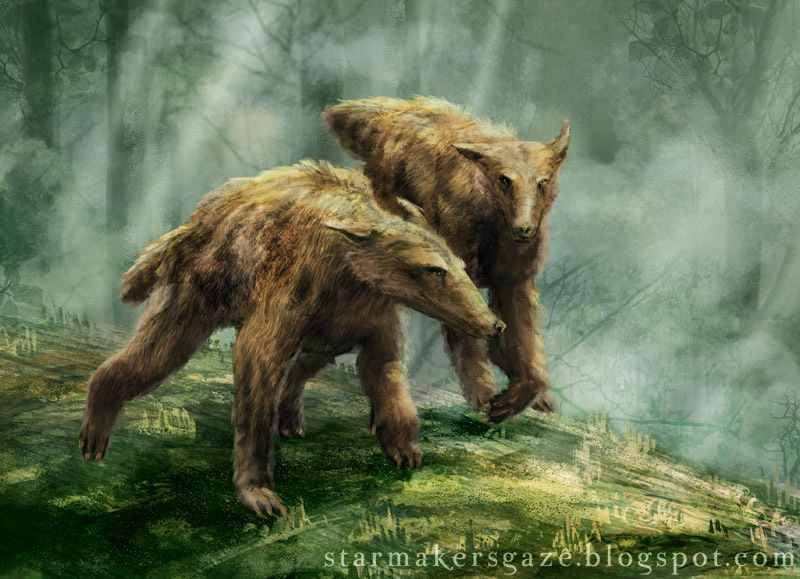 They are about three meters long, with a plushy tail, long head, and dirty-looking greenish fur. Burrmo are man-eaters - literally, in a group of people, they'll go for the humans first. Otherwise they hunt appropriately large quarry. The burrmos' ferocity is infamous, and being allowed to wear any part of them is an honour; most wanted are the thick fur and hide, claws, and teeth. Several body parts make a festive dish for hunters. Only skilled and extremely shrewd hunters will get a burrmo, however. "Korr the mage invented burrmo-steel, that is all but indestructible. Entirely appropriate, but the good joke didn't bring my arm back." Burrmos have been long known for stealing children from humans and other species, and also other animals. Rrani, gubras, even pervons have been seen hunting alongside them and obvioulsy been part of the pack. The best known abductees are the burrmo princes Darous and Darem, elven twins that have been their spokesmen for years, and are taken as bad omens by travellers these days. The actual lord or lady of the burrmo are not publicly known. "They dropped down from the branches, struck down everyone but the humans, ate the iunas, and fled with their victims. Nine days later two of them emerged from the forest again. They never said how the got away from the burrmos, but they had been given provisions and pointed the way. I later heard they left the Forest for good." I love inventing animals, and burrmo are among my current favourites, from their spelling to the abduction habit, but sketching them was hard. This is often the case for especially my critters since there are so many possibilites and my descriptions usually come first; but writing and drawing work differently, and sometimes I describe things that are really hard to get across visually.